The Xyron 4400 Laminator is a complete, professional document finishing system that laminates or applies adhesive to documents up to 44″ wide. This machine is great for finishing wide format printed documents, POP, signage and other large documents that need to be laminated quickly and cleanly. The width of the laminator is adjustable to accommodate 43″, 38″ and 25″ documents, and all you have to do is change the rolls sets between applications. The Xyron 4400 offers three solutions by instantly applying matte, gloss laminates, or adhesive to the document without heat. The input roller arms allow rolls of documents to be easily finished no matter the size. Large input tray with alignment markers and adjustable edge guide aid in document feeding.The patented supplies allow users to quickly and easily change between applications. The Xyron 4400 can accommodate gloss laminate which is a high gloss film suitable for use on a variety of substrates which has superior adhesion, excellent clarity and is compatible with most media. This machine also accommodates combination one slide lamination/ one side adhesive which are Xyron’s general use laminate ion the top surface. This machine is great for schools, printers, designers and retailers looking to laminate posters, banners, signs, and advertisements. 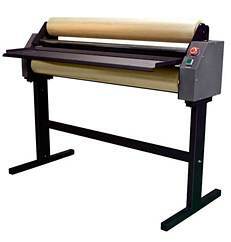 If you have any questions or are interested in purchasing the Xyron 4400 Laminator, visit us at SpiralBinding.com. We have great pricing on a full line of Xyron Cold Laminating Equipment. Call us at 1-800-631-3572 for more information!